The Winter Park Playhouse does not have a designated parking lot. However, there is free on-street parking along Orange Avenue and around the block from where the theatre is located. Please DO NOT park in the Goodwill parking lot across the street. Some neighboring businesses will allow patrons to park in their lots after business hours. 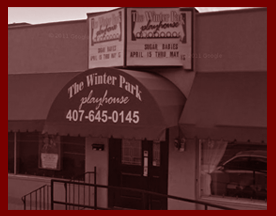 There are also many public parking lots around Winter Park that are within walking distance of the Playhouse. The interactive map below highlights nearby parking lots, dining options, and hotels. Click on a blue place marker to see how far that parking location is from the Playhouse. Clicking on the icon that resembles an expanding square (in the top right corner) will open the map in a new window for easier viewing.